Yes, that is right! 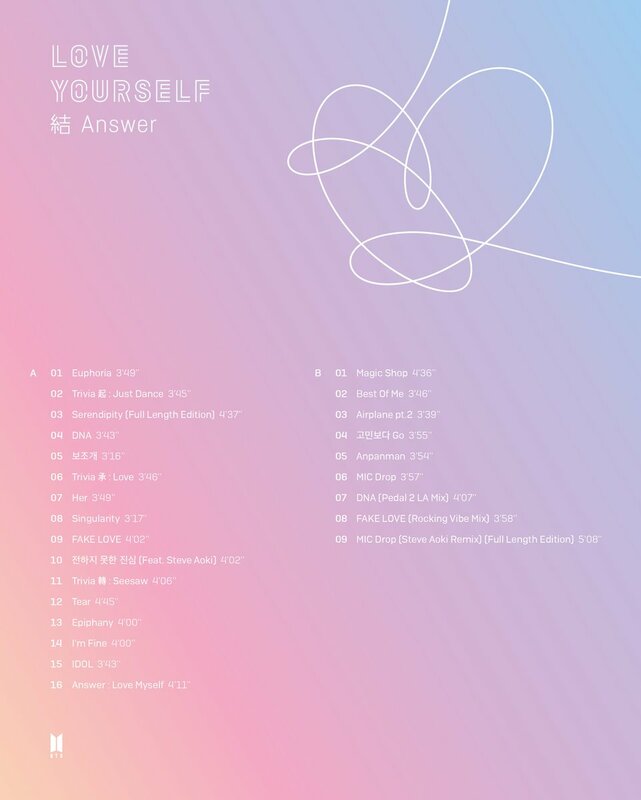 As many of you have heard – BTS has finally shared the tracklist for their upcoming repackaged album: Love Yourself: Answer! The third album from the Love Yourself series follows last year’s Love Yourself: Her and this year’s historic Love Yourself: Tear. This new album – set to be releases on 24 August- will include a total of 25 songs on two discs – Disc A with 16 tracks and disc B with 9. The fans will also find remixes of “DNA” and “Fake Love,” as well as full-length editions of “Mic Drop (Steve Aoki Remix)” ,“Serendipity” and the new track “Epiphany” sung by Jin and revealed earlier this month. The long awaited surprise will be in the form of six original tracks: “Trivia 起: Just Dance,” “Trivia 承: Love,” “Trivia 轉: Seesaw,” “I’m Fine,” “IDOL” and “Answer: Love Myself”! Each of the three “Trivia” tracks comes with a backstory. It each corresponds to the Chinese characters used in the Love Yourself series’s creative narrative, and it makes a direct reference to the storytelling form known in Korean as Kiseungjeonkyeol (기승전결 – written using Chinese characters 起承轉結). It describes the four steps of storytelling composition : introduction, development, turn and conclusion, all of which correspond to BTS releases from the past two years. And now we have an Answer as the final part of the series. The group teased some of the themes on this album which explains some events in the group’s long-running narrative. Unlike previous comebacks, BTS will be debuting the songs live through their upcoming tour, rather than through television performances. Their tour is named after their Love Yourself series and we will see the boys perform in different parts of Asia, North America and Europe.